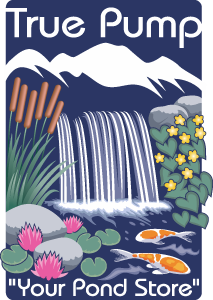 Pond filters are one of the most important components in a healthy and balanced Ecosystem Pond. Quality filtration equipment is necessary to maintain optimum water quality with minimal maintenance. Pond filters can be broken down into two main categories; mechanical filters and biological filters. Mechanical filters simply trap debris that is suspended in the pond and then they are cleaned periodically to remove this debris. A pond skimmer is a mechanical filter which removes surface debris from the pond before it falls to the bottom. We recommend an out-of-the-pond skimmer which pre-filters the pond water to prevent pump clogging and also serves as the pump vault and overflow system. All skimmer maintenance can be performed outside of the pond without ever getting your feet wet! Click here to learn more about pond skimmers. A biological filter provides surface area for beneficial bacteria to colonize and remove excess nutrients. The main types of biological filters for the average pond are in-line pressure filters and up-flow waterfall filters. For much larger ponds we recommend constructed wetland filtration. 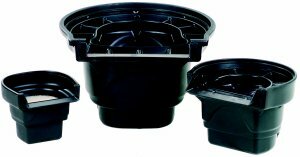 In-line pressure filters may be a good choice for smaller ponds or as a retro-fit for a pond initially installed with inadequate filtration. The biological media consists of BioBalls™ and filter pads. Pressure filters may require periodic cleaning and you should be aware not to exceed the maximum flow rate allowed. Up-flow, biological waterfall filters are the preferred choice of both contractors and homeowners. 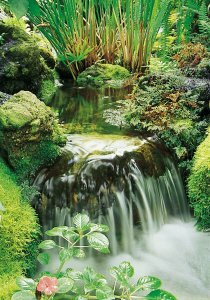 We recommend the Aquascape Biofalls® filter which can be easily naturalized and will be the start of the waterfall and stream. The attachable lip is easy to install and provides a reliable water-tight seal. The biological media consists of filter mats and either lava rock or BioBalls™. The Signature Series™ Biofalls® filters also include a rock rack which makes camouflaging them that much easier. A properly sized, up-flow biological filter requires maintenance only once per year! True Pump carries up-flow biological filters for ponds from 200 gallons to 10,000 gallons. If you have a larger pond and require constructed wetland filtration please contact us for a custom design for your individual application.